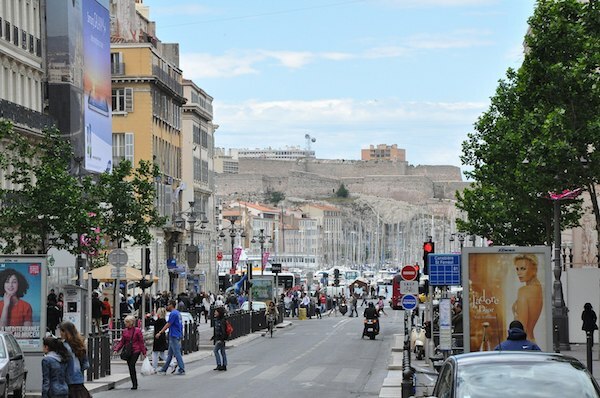 This is another ‘runseeing’ tour of Marseille, incorporating the Canebière, a wide boulevard that’s the historic ‘high street’ of Old Marseille, which stretches eastward from the Old Port (Vieux Port) to the Réformés quarter. There are very wide sidewalks, so there’s room for runners in addition to the many pedestrians! Our route incorporates some of the pedestrian-only sections of commercial and historic Marseille. Start at the eastern base of the Canebière at the Quai de Belges, and run for 1 km to the Réformés-Canebière Metro/St. Vincent de Paul Church, or 2 km to the the Natural History Museum at Parc Longchamp. Turn back around, and take a left on Rue Curiol, which takes you to the pedestrian Cours Julien, and some neat stairs to Rue Esterelle, and then left on Rue de Rome and immediate right on Rue Montgrand. You’ll then run along the pedestrian Cours Honoré-d’Estienne-d’Orves, making your way back to the Old Port. Note the route is somewhat hilly! There are lots of options to create your own route here or vary from what we’ve recommended. Add-On: Run around the Quai at the Old Port (Vieux Port). Or add our Marseille ‘runseeing tour’ of historic Marseille, including some great waterfront sections. Or, run down to the Palais de Pharo and down and along the Rue des Catalans along the water.